A California man says he has mixed emotions on what should happen to the 13-year-old accused of beating his son to death with a baseball bat after a game. The victim's father, Brian Rourke, says the family has known the boy for a long time, and doesn't want him to "lose the rest of his life." But Rourke says in a broadcast interview there has to be some punishment for what happened to his son. Fifteen-year-old Jeremy Rourke died Tuesday after prosecutors say he was hit in the knee and head after a youth league game about 40 miles northeast of Los Angeles. Rourke and the other boy apparently had words following the first loss of the year for the younger teen's team. The incident seemed to start innocently enough, by the snack bar, after a Pony League baseball game. Witnesses say Jeremy was needling and shoving the younger player for pitching a losing game when the 13-year-old seemed to snap. Witness Sam Cordova says, "They were kinda teasing each other, and the next thing you know, the boy pulled out a bat and he kinda hit him once in the side and once up around the neck, and then he just hit him really with tremendous force to the head. …His head just sounded like a pumpkin getting hit with a bat." 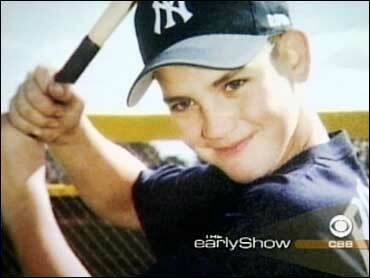 Jeremy loved baseball and was known to get into neighborhood fights, reports CBS News Correspondent Bill Whitaker. "I was just stunned and I don't know why anybody would do that," says a friend, Trevor Bloom. The accused youth will be tried as a juvenile because no one under 14 can be tried as an adult in California, said Los Angeles County Deputy District Attorney Ron Smalstig. His name was not released because of his age. He remained in custody and was scheduled to make his first court appearance Friday. If a judge finds the allegations are true, the boy could face a sentence ranging from probation to state custody until he's 25, said District Attorney spokeswoman Jane Robison. Despite the Tuesday night fight and its tragic ending, the two boys had no history of problems, said Tony Trevino, who coached the Dodgers that night. "That's what's so shocking and so appalling," he said. "What happened? What did we miss as a community? What did we miss as parents." Earlier, the suspect had appeared upset about the game but nothing seemed out of the ordinary, said Trevino, a retired rehabilitation therapist. The boy was known for being competitive but did not have a reputation for being violent, he said. Rourke was white and the suspect is black, but "racism had nothing to do with it," Trevino said. "This is a behavior problem, not a racial problem." After the attack, Trevino saw the suspect standing against a fence with his parents. "He looked scared. He was in shock," the coach said. All of Palmdale, California, a town of single-family houses that comes together over community sports, is now coping with this tragedy, reports Whitaker. "It's like a family," said one neighbor who knew both boys. Hundreds of people lit candles at twilight, praying to understand the incomprehensible -- why a scared 13-year-old used his bat as a weapon and why his 15-year-old friend lay dead.